Mashed sweet potato bacon cups. Well, that is a mouthful! Seriously, they are an oversized single-bite appetizer or side dish you won’t be able to stop eating! Ok, maybe they are really more like two-bites, but who’s counting?! We love appetizers and snacks that are just out of the norm, but still easy to create, with simple ingredients, yet packed with flavor. Plus, we love bacon, and bacon makes everyone happy, so we should all absolutely eat more of it! Bacon for all! 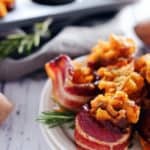 Just look at how the mashed sweet potatoes billow over the edges of the crispy bacon. There are really just a couple of steps. Cube your sweet potatoes and boil them until tender. Then whip up the mashed sweet potatoes with some butter or ghee, garlic and rosemary. I prefer to use a hand masher so some chunks remain. 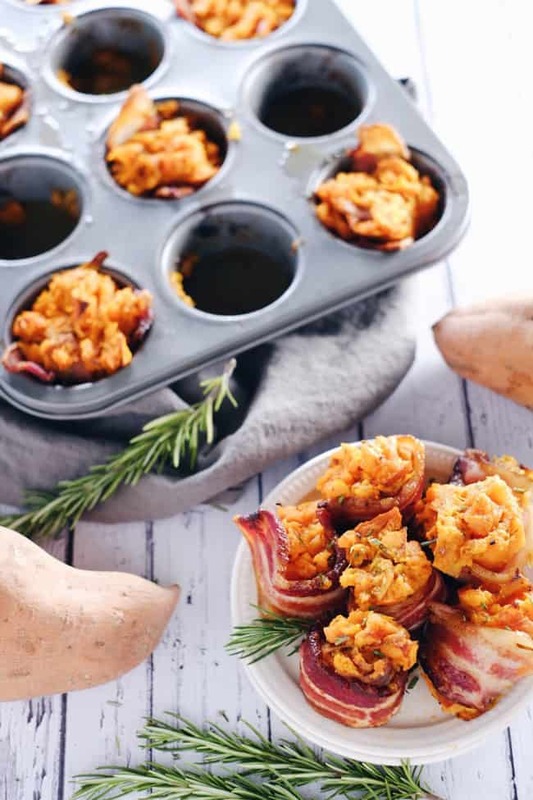 Next up, create these little cups of heaven by lining a muffin tin with bacon, and fill up the little bacon cups with your mashed sweet potatoes. Bake them up until the bacon is crispy, and voila! It’s easy! Enjoy the crispy, salty bacon with your savory mashed garlic rosemary sweet potatoes. I love to add a little drizzle of maple syrup on top. The touch of sweet makes this bite dance on your taste buds. It’s savory, salty, and sweet. Like really, is there anyone out there who doesn’t love bacon?! It pretty much rocks my world. Ok, it is time! 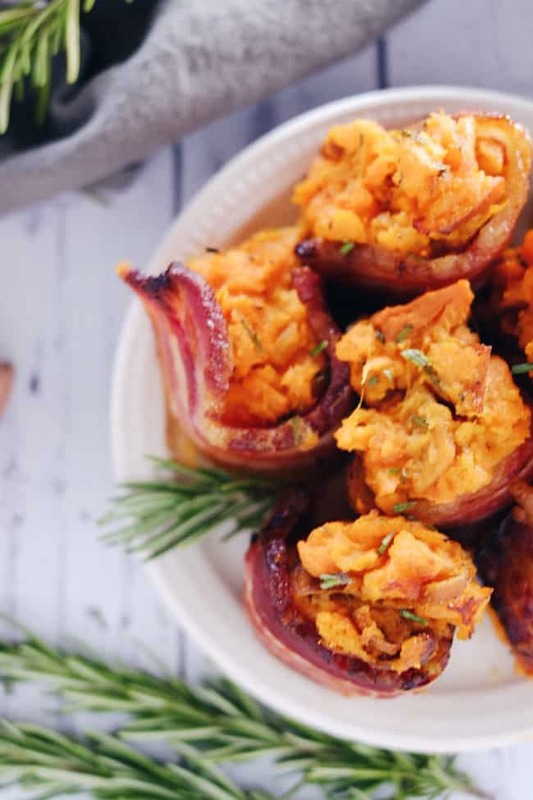 Go make these mashed sweet potato bacon cups! Leave a comment below to let us know how it goes, and take a photo and tag us on Instagram @realsimplegood so we can check it out! Place your cubed sweet potatoes in a large pot. Submerge them in water and place on the stove over medium-high heat. Boil until the sweet potatoes are tender. While the sweet potatoes are boiling, line your muffin tin with the half strips of bacon to create a little cup. We place them in the muffin holes from one end to the other, so that the bottom gets covered. Set aside when finished, and preheat your oven to 400 degrees fahrenheit. Once tender, remove your sweet potatoes from heat and drain the water. Place your sweet potatoes in a large mixing bowl. Add your grass-fed butter or ghee, chopped rosemary, and granulated garlic. Hand mash or use an electric mixer to get your mashed sweet potatoes to your desired consistency. We like them a little chunky. 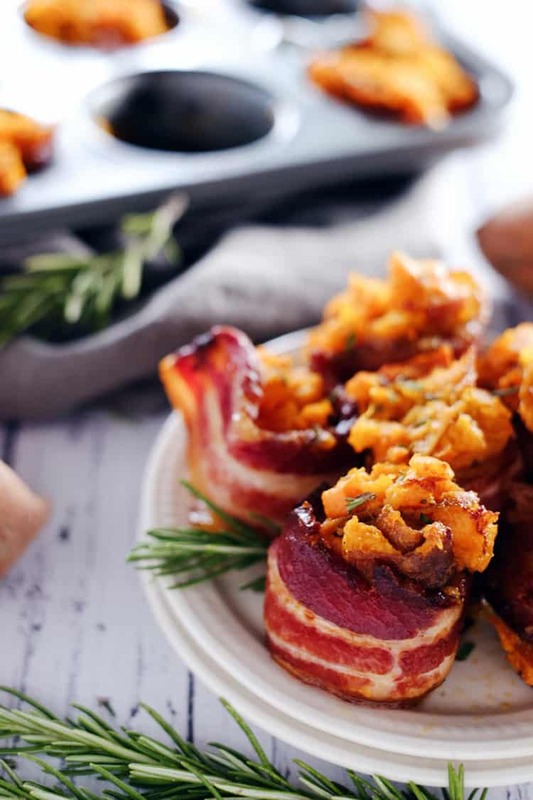 Scoop your mashed sweet potatoes into your bacon cups, and place them in the oven. Bake at 400 degrees for 20 minutes, or until the bacon is crispy. Remove from the oven, let cool for a few minutes by placing on a paper towel lined plate to catch the excess bacon grease. When ready to serve these little guys, flip them onto their sides so the bacon wraps around the sides like in the pictures above. Drizzle with optional maple syrup on top if you're feeling a little daring, and serve! Eat 'em up! This is just so beautiful to be eaten!! I love sweet potatoes and who doesn’t love bacon right? Thanks for the breakfast ideas!! Thank you! That’s so kind of you! Hope you enjoy these little gems! They turned out great!! Thanks for visiting! Made them but maybe I used the wrong size muffin tin? Didi youuse a mini pan? I used a regular size muffin and the dont stand up very well.? Could you make the bacon cup ahead and fill with hot sweet potato when ready to serve? We haven’t tried it and I’m not sure how the bacon would turn out doing it ahead of time. If you try it let us know how it goes!